Leakage means an imperfection of any rigid interface – a joint that allows gas to penetrate through the pressure drop – gas, steam, liquid. These are defects that are geometrically small so they are not detectable by other non-destructive methods. 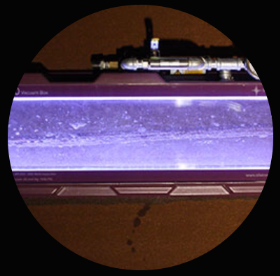 Using this NDT method, we start from the fact that absolute leakage cannot be achieved and therefore the test is defined by the rate of penetration per unit of time. We distinguish two types of leakage testing: integral (determines leakage) and location tests (determines the location or estimates the size of the defect).